Synopsis: We all have a mind, so we all need to take care of our mental health as much as we need to take care of our physical health. And the first step is being able to talk about our mental health. 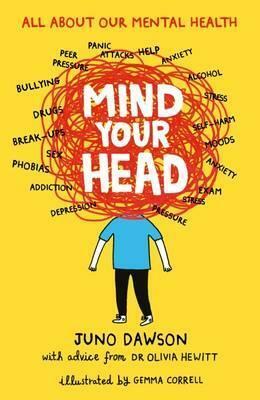 Juno Dawson leads the way with this frank, factual and funny book, with added information and support from clinical psychologist Dr Olivia Hewitt. Covering topics from anxiety and depression to addiction, self-harm and personality disorders, Juno and Olivia talk clearly and supportively about a range of issues facing young people’s mental health – whether fleeting or long-term – and how to manage them, with real-life stories from young people around the world. Before I start – this probably isn’t going to be a mini review, but more of a discussion or chat. As this is more of a non-fiction/guide, there are no characters etc to explore, but I definitely want to talk a lot about this one! Saying that, I don’t know where to start or how to describe this book. It’s not one you can rate using a star system as such – I think it’s kind of beyond that, actually. The easiest way to say it is this book really opens your eyes. It’s important, and it needs to be read by everyone in the whole world. You shut that back page wanting to hand it around to everyone you know and tell them to read it. You could say it teaches you…it teaches you some of the most important lessons you could ever learn. I want to start by telling you guys something. For the past few months I’ve been struggling with extreme mood swings (literally hour to hour) and anxiety. I’m due to start college in just a couple of weeks now and it’s really affecting me day-to-day, making me nervous about things I would normally do without batting an eyelid. It’s going to be a difficult month for me, but I’m trying my best to get through it and for the first time in my life, I believe I will be able to. But this book has really helped – because it’s made me realise that maybe I will need, somewhere along the line, to talk to someone about my anxiety. That it’s okay that I feel that way sometimes, and there are people out there who will – and want to – help and support me. All that aside, back to the book! Put simply, it isn’t an easy read – but I don’t think it should be, either. It talks about a lot of difficult subjects – and it is difficult to get through a few parts if they’re close to your heart. But Juno does an amazing thing with her writing…she makes it easy to read, easy to digest even, and funny. Not funny ha-ha as such, but witty. She has a way with words that is perfect for this kind of book. There is just one more thing that needs to be said – whether you suffer (or have suffered) with any of the things talked in this book, know someone who has, or just want to learn more about your mental health…you need to read this book. Go on, do it, now. Go read it. Are you still reading? Go, I said. Go.